18/06/2018, Abu Dhabi: Emirates Motor Company - Commercial Vehicles (EMC - CV) has been honoured with a prestigious international industry award in recognition of its outstanding levels of after-sales service and customer care. Abu Dhabi-based EMC - CV was presented with the prize for ‘Best Service and Parts Performance for 2017 - Vans’, as the top performing general distributor of Mercedes-Benz commercial vehicles outside of Europe. 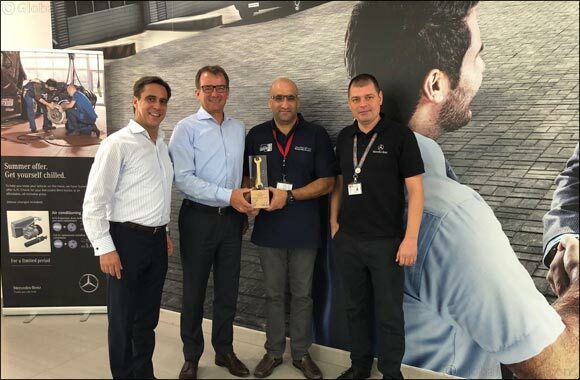 This is the first time EMC - CV wins this global award from the Daimler AG Vans division, and the first time a general distributor from the MENA region has been presented with the trophy. EMC - CV, the authorized distributor of Mercedes-Benz vehicles in the Emirate of Abu Dhabi and the flagship company of ALFAHIM, saw off competition from distributors in 116 countries to win the coveted title. The award is the culmination of 12 months of hard work by the EMC - CV After-sales team and its ongoing dedication to customer satisfaction. Thomas Greipel, General Manager Vans DCV MENA, officially presented the trophy to Mr. Bilal AlRibi, General Manager of EMC - CV, and Mr. Zavisa Stojanovic, Manager Aftersales EMC - CV, at a ceremony. Mr AlRibi said: “Winning the award for ‘Best Service and Parts Performance for 2017 – Vans’ is a significant honour for EMC - CV. We are delighted to have been presented with this iconic international award as recognition of the after-sales team’s commitment to excellence.